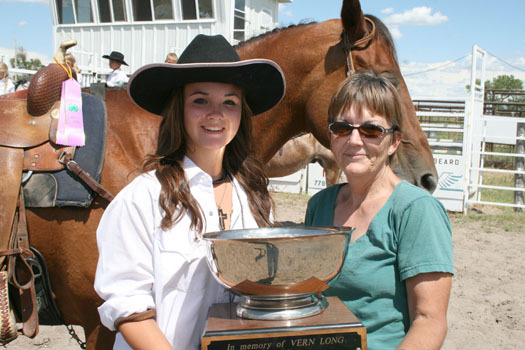 Shavin Barnhart receives the Vernon Long Traveling Memorial Trophy from Jean Long for overall Senior Horse. LEWELLEN, Neb. – Garden County 4-H Horse Show was held on Aug. 5, 2010, at Lewellen, Neb. Eleven 4-H members participated in Showmanship, Western Horsemanship, Pleasure, Trail, Reining, Pole Bending and Barrel Racing. Since the beginning of April, the horse kids have worked hard on their basic horsemanship skills, learning about horse care and improving reining patterns. Some of the skills they worked on were learning showmanship, lead changes, loping in round circles, working gates, moving the horse laterally, and improving times on speed events. It was a beautiful day for the spectators to watch a very good horse show.